The SkyPark, the eternal home of epic selfies. Image courtesy of the Marina Bay Sands. It’s hard to think about the city-state of Singapore without imagining the iconic Marina Bay Sands resort. When it opened its doors in 2010, it was called the world’s costliest casino property at a price tag of $5.6 billion. While the infinity pool is only open to hotel guests, head to the 57th floor, the ever-popular SkyPark, for a photo op. If you are still jonesing for some fun in the sun, Sentosa Island offers several beach bars, including Tanjong Beach Club, where you can kick back and be lazy. Another way to get outdoors is to stroll Singapore’s 157-year-old botanical gardens, a UNESCO World Heritage Site. A huge draw to the Singapore Botanic Gardens is its National Orchid Garden, which can be viewed for a nominal fee. If you want to walk in the footsteps of locals, however, you have to really love shopping (try Bugis Street for inexpensive souvenirs) and eating. Save cash and have a truly local experience by lunching at a Hawker Centre such as Tiong Bahru Market or Maxwell Road Hawker Centre. There, you’ll find local favorites such as cendol (shaved ice with syrups and beans), carrot cake (a savory dish, which is neither carrot nor cake) and chicken rice (yep, you guessed it). Singapore Botanic Gardens. Image courtesy of the Singapore Tourism Board. 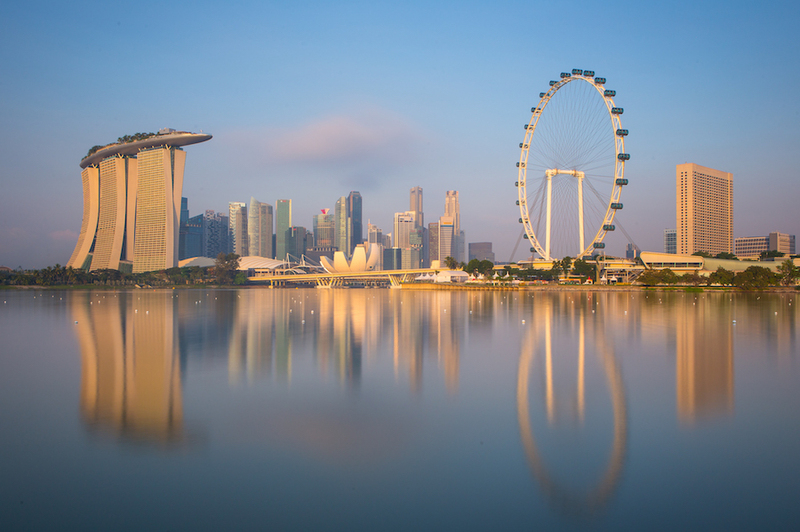 More than anything, Singapore is a melting pot of cultures, religions and traditions. And it’s common for locals to take time from their day to pray at a nearby temple. Some impressive temples I suggest you check out: Sri Veeramakaliamman Temple, Sri Ruthra Kaliamman Temple, Kwan Im Thong Hood Cho Temple and the Buddha Tooth Relic Temple and Museum. I was lucky enough to be in Singapore during the Hungry Ghost Festival, when the spirits of the dead are thought to roam freely. During this time, locals are extra cautious, and they make a point to honor the dead with offerings of food and by symbolically burning paper tablets in their honor. It is believed that the ghosts of dead can assist and protect the living. So be on your best behavior in Singapore. Your ancestors might be watching. Buddha Tooth Relic Temple and Museum. Image Courtesy of the Singapore Tourism Board. Singapore's skyline. Image Courtesy of the Singapore Tourism Board. Tanjong Beach Club. Image Courtesy of the Singapore Tourism Board. Everything lights up at night. Image Courtesy of the Singapore Tourism Board. My trip to Singapore was made possible by Singapore Airlines, the Singapore Tourism Board and my wallet. Views expressed are my own.